The entire proceedings from the time a taxpayer receives a notice to the time the assessing officer passes the final assessment order determining the final taxable income of the taxpayer is called an assessment proceeding. A scruntiy assessment notice can be issued with one year from the end of the financial year in which the return of income has been filed. Raghav filed his income tax return on 5th July 2017 for the year ending 31st March 2017. The return has been filed in FY 2017-18. 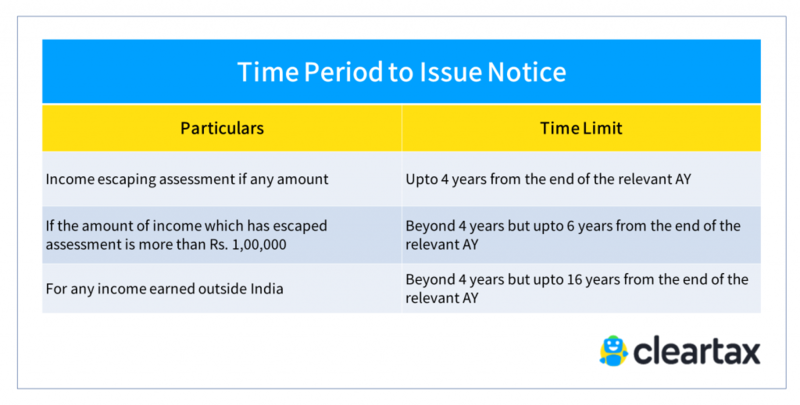 Therefore, Raghav can be issued an assessment notice anytime before 31st March 2019. If an AO has any reason to believe that any income chargeable to tax has escaped assessment, the AO has authority to reopen the case for scrutiny. Scrutiny proceedings in the case of Mr Rohan for FY 2015-16, have concluded and the tax authorities are in agreement with the income Rohan has disclosed in his return. Subsequently, the assessing officer receives some information with regard to a sale of land that Rohan has carried out during the FY 2015-16, capital gains from which, was not disclosed by Rohan in his return for FY 2015-16. On the basis of such information, the AO can reopen the assessment. As per law, a valid notice must always be served before an assessment or reassessment. In case of reassessment the AO must record the reasons for doing so.